The Secretariat of the International Partnership for the Satoyama Initiative (IPSI) held a side event during the Twelfth Meeting of the Conference of the Parties to the Convention on Biological Diversity (CBD COP 12) in the CEPA Fair building at the CBD COP 12 venue at the Alpensia Resort in Pyeongchang, Republic of Korea on 6 October 2014. The title of the event was “Contribution to the Aichi Biodiversity Targets from the ground up: Engaging diverse communities and perspectives through the Satoyama Initiative”, with the aim of demonstrating approaches for gathering and engaging stakeholders at various levels in a collective dialogue for the sustainable use of biodiversity in culturally and socio-ecologically important landscapes. 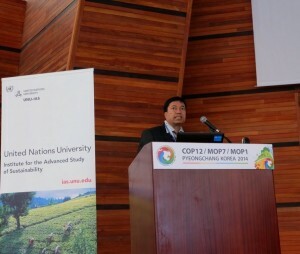 Dr. Kazu Takemoto, Director of the IPSI Secretariat and the United Nations University Institute for the Advanced Study of Sustainability (UNU-IAS), began the event with a brief introduction to his IPSI and UNU-IAS, and also thanked the Secretariat of the Convention on Biological Diversity (SCBD), as well as the Ministry of Environment of the Republic of Korea for hosting the events in Pyeongchang and for its contributions to IPSI as a member since the beginning of the partnership. He then gave a brief outline of the side event before introducing the keynote speaker, Professor Kazuhiko Takeuchi, Senior Vice-Rector of United Nations University. Prof. Takeuchi’s speech was titled “Sustainable Development and the Satoyama Initiative”, and emphasized the importance of combining the sustainable development agenda with issues of biodiversity, also the theme of CBD COP 12. 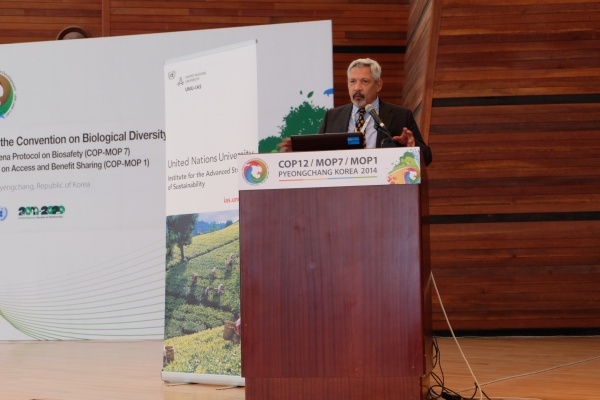 He stressed the consistency of the Satoyama Initiative’s ideals with other key international frameworks and discussions, such as the Aichi Biodiversity Targets, IPBES, and the Post-2015 Development Agenda. He then introduced the Initiative’s relevance to the proposed Sustainable Development Goals (SDGs), including those on food security, water and sanitation, sustainable consumption and production, cities and human settlements, oceans and coasts, and terrestrial biodiversity. 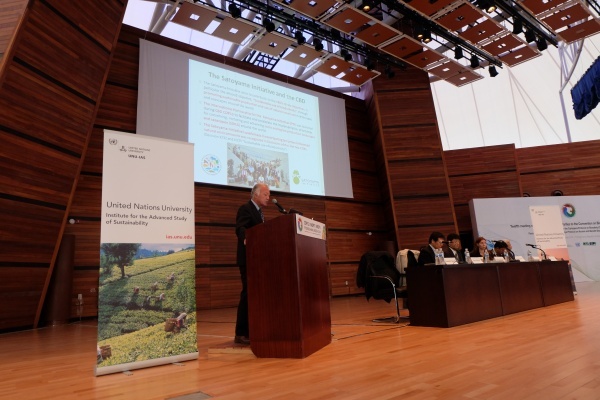 He also provided some keys to successful models for sustainable development gathered from experiences under the Satoyama Initiative, namely strengthening ecological resilience, creating new commons, and creating new business models. Moving on to IPSI itself, he then gave an outline of the partnership and its development up to the present, announcing that it had just grown to 164 member organizations, and presenting an overview of IPSI events since the previous COP meeting (CBD COP 11), including the Fourth and Fifth IPSI Global Conferences (IPSI-4 and IPSI-5), and the Satoyama Initiative Regional Workshop held in Florence, Italy. Finally, he stressed IPSI’s utility in linking local and global efforts through its broad-based and diverse membership, pointing out that having members get together at events such as CBD COP is useful to improve IPSI’s functionality in this respect. During the following question-and-answer session, Dr. Thomas Elmqvist of the Stockholm Resilience Centre was invited to give comments from the floor, and spoke about how concepts of resilience in combined socio-ecological systems are not fully developed yet, saying that the Satoyama Initiative is a good tool for this purpose. Answering other questions, he stressed the importance of understanding the relationships between urban life and surrounding SEPLS, and the need to incorporate the Initiative’s concepts into more global- and national-level targets and action plans. As positive example, he singled out Japan’s NBSAP, which includes the Satoyama Initiative. Four presentations on IPSI activities followed. The first of these was by Mr. Masao Nishigaki, Group Manager in the Nature and the Environment Division of the Prefectural Government of Fukui, Japan, which was also the host of the IPSI-4 conference in 2013. Mr. Nishigaki spoke on “Conservation of Satoyama in Fukui Prefecture for Future Generations”, giving an introduction to Fukui and its satoyama and satoumi landscapes and seascapes, in which more than 160 NPOs are working for their conservation and restoration. He then presented two activities from among a number of activities carried out in Fukui: an effort to rehabilitate the Oriental white stork (Ciconia boyciana) population including production of branded stork-safe rice; and a nature restoration project in the Mikata Five Lakes region under a multi-stakeholder partnership including farmers, fishermen, NPOs, scientists and municipalities. He also introduced the Fukui Prefectural Satoyama-Satoumi Research Institute, which was established after IPSI-4, and its various activities including research into the varves (laminated sediments) in Lake Suigetsu. Prof. Bishnu Hari Pandit, Chair of the Board of Directors of Kathmandu Forestry College (KAFCOL) in Nepal, spoke next, on “Piloting the preparation and implementation of LBSAP for conservation and livelihood benefits of rural people in three ecological landscapes of Nepal”. This project has received funding as part of the Satoyama Development Mechanism (SDM), to create Local Biodiversity Strategies and Action Plans (LBSAPs) for three very different ecosystems. It involves stakeholder consultation and analysis, creation of committees for environmentally friendly local governance, coordination of functions and roles, and identification of priority issues before finally creating common strategies and action plans. Prof. Pandit gave the Satoyama Initiative credit for having a measurable effect on poverty reduction in the target areas. Ms. Diana Salvemini, Project Manager of the Community Development and Knowledge Development for the Satoyama Initiative (COMDEKS) Programme at UNDP, gave a presentation titled “Communities in Action for Landscape Resilience and Sustainability: the COMDEKS Programme”. She provided an overview of the COMDEKS Programme, which has provided small-grant funding to on-the ground efforts to develop sound biodiversity management and sustainable livelihood activities to increase community resilience and to maintain, rebuild, and revitalize socio-ecological production landscapes and seascapes (SEPLS) in 20 countries around the world. In particular, she explained how local communities are involved in the processes of baseline assessment and strategy development in order to identify effective activities for implementation. She then provided emerging lessons learned from the programme’s experiences, mainly concerning the need for community participation in adaptive management and governance. She also introduced new publications recently produced about COMDEKS and its activities. The final speaker was Dr. Pablo Eyzaguirre of Bioversity International (BI), who talked about the development of the “Indicators of Resilience in Socio-ecological Production Landscapes and Seascapes (SEPLS)”, a project jointly being undertaken by BI, UNDP, the Institute for Global Environmental Strategies (IGES) and UNU. He explained the purpose of these indicators as measuring a community’s capacity to adapt to change while maintaining biodiversity, and stressed the usefulness of assessment in developing and linking strategies to enhance resilience as a holistic concept that incorporates social as well as ecological factors. He then introduced their testing around the world up to this point and touched on some of the gaps in the indicators’ initial framework – including lack of recognition of ecological mobility throughout the seasons and different views on gender – as identified in this testing, using Mongolia and Fiji as cases. On the other hand, he mentioned some of findings on ways in which the indicators are useful, such as providing a better understanding of linkages between terrestrial and aquatic environments, improved communications among neighbouring communities, and a better sense of ownership and responsibility over management processes, promising that lessons learned from these cases will feed into the next revision of the indicators. In response to Dr. Eyzaguirre’s presentation, the subsequent panel discussion included the question of whether the forthcoming toolkit for the indicators would be appropriate for use by local communities themselves, and the indicators’ relationship to larger-scale processes such as the mid-term review of implementation of the CBD Strategic Plan. Dr. Eyzaguirre responded that use of the indicators would generally, but not necessarily, require outside facilitation, and that they could provide input for scaling-up to CBD processes like National Biodiversity Strategies and Action Plans (NBSAPs), where a larger view of conservation is needed. On the other hand, it was pointed out that the implementation of strategies and action plans can be made difficult in areas with no effective local government. Dr. Takemoto finally took the floor again to wrap up the event, thanking all of the panelists and audience members for their participation in the active and productive discussion. The flyer for the Side Event is available for download here.